This image is about 1 1/2 centimeters wide on the actual rock. Here we can see the light minerals (quartz and feldspar), and the intermixed black minerals (mostly biotite). 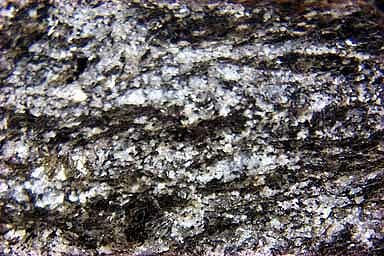 Schistose foliation is composed of intermixed quartz, feldspar, and biotite (with some possible amphibole). The minerals in this specimen are well intermixed, characteristic of the schistose pattern, although at this scale one might want to call it gneissic banding. It is a matter of scale though; if you have to get this close to see the minerals separating into bands you are still in the schist realm.